Ban Xiengda now has running water for the first time, allowing children and women to trade off time and energy for hauling water uphill over great distance for school and other family essential activities, thanks to the leadership of the Rotary Club of Ladner and sponsorship of many other Rotarians, including District 5040, 5050 and 7070 in Ontario. 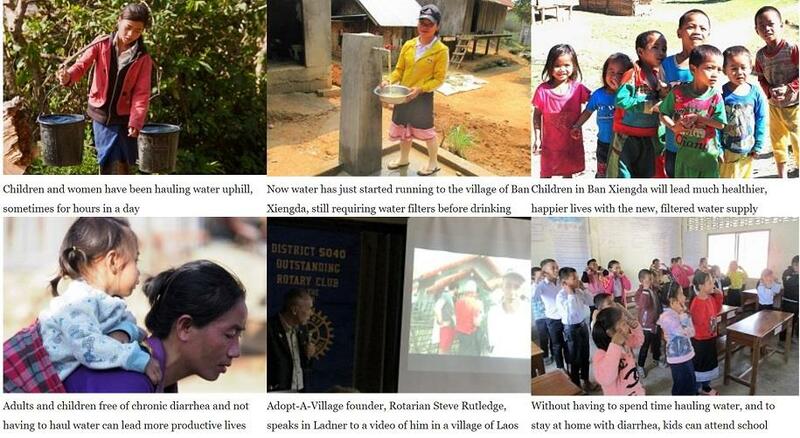 Members of the Rotary Club of Ladner had been visiting Ban Xiengda and other remote villages of northern Laos in recent years to deliver water filters and, in turn, enable education under the registered charity, Adopt-A-Village in Laos program, founded by Rotarian Steve Rutledge. 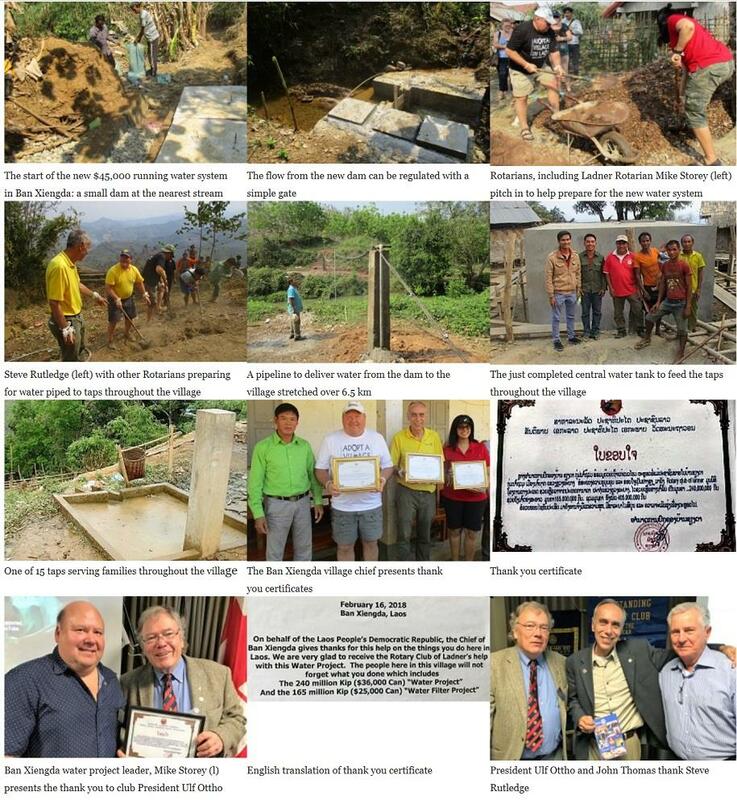 When the water supply challenge was identified Rotarians took action. To enable women and children to avoid the constant trek to the nearest water supply and long, arduous uphill trek back home when they could be in school or engaged in other productive family and village activities, the Rotary Club of Ladner undertook the lead in constructing a $45,000 special project to deliver water directly to the village, including a dam, 6.5 km of pipe and 15 taps throughout part of village. 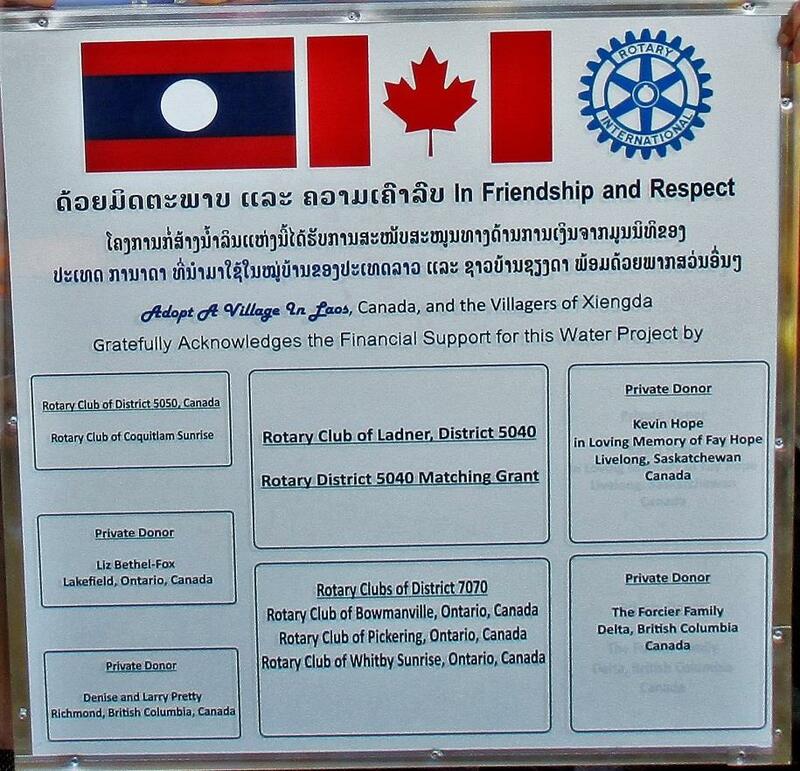 Joining the Rotary Club of Ladner’s 45% funding of the project were neighbouring club of Tsawwassen, Rotary District 5040 with a grant from The Rotary Foundation for 22% and neighbouring Rotary District 5050, with Rotary District 7070 in Ontario, for 34%. Visiting remote villages of Laos, with other Rotarians and friends, to deliver water filters and leading back home fund-raising for the Ban Xiengda water delivery project have been Ladner Rotarians, Mike and Kathy Storey who have led the project, Diana Nimsick with daughter Tamara, Sonia Baron, Sandra O'Keeffe and Dawn and Beau Rutledge-Brennan, who joined a team of others involved in the Adopt-A-Village program. Rotarians and Friends have assisted in the construction of water towers with taps for the village including ground levelling, forming and tying metal rods, mixing cement etc., in addition to the many activities to make construction possible, such as fundraising, logistics, materials purchase and delivery, donor reporting and accountability reports. 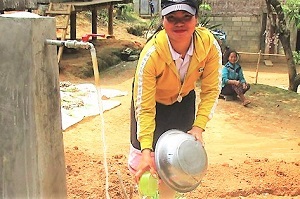 Now water is running for the first time to the village of Ban Xiengda, allowing children time and energy to attend school instead of hauling water, and, with use of the water filters, to stay healthy enough to do so. To ensure that the system keeps functioning as the community rapidly expands, the village chief has assigned responsibility to certain villagers who will ensure the dam is kept clear of obstructions, taps are in continuous working order and pipes are repaired as required. The lifetime of the system is estimated to be 20 years.